Research on internal benefits of volunteerism has been a growing area of interest in psychology. The majority of research on volunteerism suggests that volunteering produces internal benefits after volunteering (Astin, Sax, & Avalos, 1999; Marta & Pozzi, 2008; Mellor et al., 2008; Pillavin & Siefl, 2007; Strage, 2004; Thoits & Hewitt, 2001). Researchers have used surveys and interviews to show that there appears to be a positive correlation between volunteerism and psychological well-being (Mellor et al., 2008; Pillavin & Siefl, 2007; Thoits & Hewitt, 2001). Mellor et al. (2008) broke down the concept of well-being into measurable characteristics such as self-esteem, optimism, perceived control, and low depression scales. Other aspects of well-being that were measured across studies include physical health and happiness (Pillavin & Siefl, 2007; Thoits &Hewitt, 2001). Results of these studies are consistent in stressing that individuals who actively participate in volunteerism benefit from decreased depression levels, increased happiness, and increased self-confidence (Mellor et al., 2008; Pillavin & Siefl, 2007; Thoits & Hewitt, 2001). Similarly, when researchers looked at long-term effects of volunteerism, there appeared to be an array of positive effects on individuals (Astin et al., 1999; Marta & Pozzi, 2008; Pearce, 1983; Pillavin & Siefl, 2007; Strage, 2004). The most commonly used method for collecting data for longitudinal studies was the use of surveys and interviews (Astin et al., 1999; Marta & Pozzi, 2008; Pillavin & Siefl, 2007). Some research suggests that individuals who participate in volunteerism early in life are positively affected from their experiences in the long term (Astin et al., 1999; Pillavin & Siefl, 2007). Pillavin and Siefl (2007) suggested that when people continue to volunteer for an extended period of time, they tend to experience positive aging. Similarly, Astin et al. (1999) carried out a longitudinal study of the impact of community service learning in college students. The data for this study showed that short-term effects of volunteering, such as values and attitudes, “continued to have effects at least through the first five years following the completion of college”(Astin et al., 1999, p. 200). Another study compared job attitudes and motivations between volunteers and paid employees who perform similar jobs. Data suggested that volunteers had more positive job attitudes and more altruistic motivations for working (Pearce, 1983). Individuals who volunteered were more likely to report that they work for social interaction and service to others than were paid employees. Thus, data from this study suggested that volunteers are more satisfied and less likely to leave organizations in the long term than were paid employees (Pearce, 1983). In addition, research has found that positive long-term effects of volunteerism can manifest itself in other ways. Strage (2004) examined if participation in volunteerism was correlated to academic benefits. The methodology for this study consisted of looking at academic records of students in the same class, half who volunteered and half who did not. The study concluded that service learning may provide a foundation for promoting academic success and personal growth (Strage, 2004). However, one must take into account that not all individuals will have the same response to their volunteering experience. Marta and Pozzi (2008) argued that community service placement or location may be a determining factor on how an individual viewed his or her experience. In other words, if an individual did not like their community service site, he/she may not experience the same internal benefits and may not want to volunteer in the future (Marta & Pozzi, 2008). individuals, researchers began to look at how volunteerism impacts groups. One specific group of volunteers that have been of growing interest is college students (Astin et al., 1999; Levine & Hirsch, 1991; Lundy, 2007; Marta & Pozzi, 2008; Trudeau & Devlin, 1996). Researchers became interested in college students because it was reported that there was a rising trend in community service participation. In fact, it was reported that approximately 28.1% of college students participated in volunteering by 1993 (Trudeau & Devlin, 1996). Primarily, data were collected through questionnaires and interviews to get an idea of how many college students were participating in volunteerism (Astin et al., 1999; Levine & Hirsch, 1991; Marta & Pozzi, 2008; Trudeau & Devlin, 1996). Then, different research studies varied in approaches on how to analyze the relationship between college students and volunteerism. Levine and Hirsch (1991) performed a longitudinal study that examined rising trends of volunteerism among American college students. Data suggested that college students who volunteered became more involved in student activism on campuses than did their non-volunteering peers (Levine & Hirsch, 1991). A different way to look volunteerism and college students is to focus on possible gender differences. One study looked for common characteristics among students who chose to volunteer and why they chose to volunteer (Trudeau & Devlin, 1996). Trudeau and Devlin (1996) surveyed 124 college students and found that women were more interested than were men in volunteering. In addition, data demonstrated that “female students were significantly more motivated by altruistic intention factors, such as wanting to create a better society, than were male students”(Trudeau & Devlin, 1996, p.1885). Measuring different dimensions of volunteerism gives insights on intentions behind volunteering. In addition to looking at college students and their growing participation in volunteerism, researchers began focusing on the rising trend of required volunteerism on college and university campuses (Beehr, LeGro, Porter, Bowling, & Swader, 2010; Giles & Eyler, 1994; Strage, 2004; Stukas & Synder, 1999). One may argue that requiring students to volunteer for course credit appears to contradict the simple definition of volunteerism. According to Penner (2004), there are four aspects that define volunteering. He argued that volunteering is a planned action, a long-term behavior, and occurs within an organizational context. In addition, his research specifically stated that volunteering involves non-obligated helping (Penner, 2004). Despite this contradiction, required volunteerism persists as a growing trend on college campuses across the United States (Beehr et al., 2010; Giles & Eyler, 1994; Markus, Howard, & King, 1993; Strage, 2004; Stukas & Synder, 1999). students who are mandated to volunteer for class credit, experience the same reactions to community service as do non-required volunteers (Beehr et al., 2010; Giles & Eyler, 1994; Hatcher & Bringle, 1997; Strage, 2004; Stukas & Synder, 1999). Some studies suggested that required volunteerism should continue to be adopted into college curricula (Astin et al., 1999; Barber & Battistoni, 1993; Giles & Eyler, 1994; Strage, 2004). One study examined student reactions to a 3-hour a week community service laboratory (Giles & Eyler, 1994). A questionnaire was administered to students three different times during a semester to reflect on how their volunteering was going. Giles and Eyler (2004) found that requiring students to participate in community service significantly increased the idea that they can make a difference and help others. An almost identical study suggested that when linked to learning objectives, service learning enriched college students and made coursework more dynamic (Hatcher & Bringle, 1997). Similarly, Astin et al. (1999) collected data from 279,985 college students to explore if participation in community service during college had a long-term impact. Data from this study showed that there was “a significant positive effect on the student’s perception of how well the undergraduate college prepared the student for work” (Astin et al., 1999, p. 200). Further, research has supported the notion that requiring college students to volunteer produces academic benefits (Barber & Battistoni, 1993; Lundy, 2007; Markus et al., 1993; Strage, 2004). Data has supported the notion that students who were required to volunteer received higher course grades than do their non-volunteering peers (Lundy, 2007; Markus et al., 1993). In addition, in classes that required service learning, students reported performing up to their full potential and believed they were more likely to apply class materials to outside situations than were their non-volunteering peers (Markus et al., 1993). Perhaps the most vocal source behind the idea that students should volunteer to receive positive academically effects came from Rutgers University researchers (Barber & Battistoni, 1993). It was argued that integrating “service into the classroom is a fashion that promotes the cognitive, communicative, and moral dispositions needed by citizens in a working democracy” (Barber & Battistoni, 1993, p. 239). It seems as though research has thoroughly supported the notion that community service provides countless rewards to students and thus required volunteerism should be integrated into curricula. students to volunteer may affect the experience and students’ reactions to the experience (Beehr et al., 2010; Stukas & Synder, 1999). Stukas and Synder (1999) used surveys to examine if students who were required to volunteer felt differently about their experience than did non-required volunteers. Specifically, Stukas and Synder (1999) examined whether requiring students to volunteer affects their future intention to volunteer. Data suggested that mandatory volunteering reduced the likelihood that individuals would volunteer in the future in comparison to what was true of non-required volunteers (Stukas & Synder, 1999). These data suggest that removing the choice behind volunteering reduces the positive effects that one can gain from freely volunteering. Correspondingly, later studies suggested that required volunteerism decreases the positive impacts of volunteerism. For example, Beehr et al. (2010) examined different responses to volunteering between required volunteers and non-required volunteers. Data were collected by surveys to determine if required volunteers had decreased positive reactions to volunteering compared to non-required volunteers (Beehr et al., 2010). Results of the study suggested that required volunteers had less intrinsic motivation than did non-required volunteers because they were more focused on how volunteering affected their grade (Beehr et al., 2010). Thus, taking away a student’s freedom to choose to volunteer may be linked to decreased intrinsic motivations and internal benefits. Based on these studies, it was hypothesized that Connecticut College students who volunteer by their own volition will report greater internal benefits from volunteerism than will those required to volunteer. This hypothesis expands on data that suggested that volunteering positively impacts individuals (Astin, Sax, & Avalos, 1999; Marta & Pozzi, 2008; Mellor et al., 2008; Pillavin & Siefl, 2007; Strage, 2004; Thoits & Hewitt, 2001). The positive effects of volunteerism that will be examined include self-esteem and hope. In this study, hope will be defined as “a cognitive set that is composed of a reciprocally derived sense of successful agency, or goal-directed determination, and pathways, planning of ways to meet goals” (Synder et al., 1991, p. 570). In addition, this study will support previous findings that students who are required volunteers have differing motivations and lessened positive outcomes from their volunteering experience than do their non-required volunteering peers (Beehr et al., 2010; Stukas & Synder, 1999). The researcher plans to measure these dependent variables with three separate surveys. This study used a between subjects design. This research design used a quasi-independent variable with three levels. The three levels are required volunteers, non-required volunteers, and non-volunteers. The participants in this study consisted of 79 Connecticut College students in introductory psychology courses. Of the 79 students that participated in the study, 79.7% of all participants reported that they had previously volunteered. In addition, 84.8% of participants consisted of first and second year students. Also, 84% of participants indicated that they were Caucasian. This suggests that the participant sample was somewhat skewed in terms of class year and there was a lack of diversity. The Functional Approach to Volunteers’ Motivations Inventory. The Volunteer Functions Inventory measures motivations and outcomes of volunteering (see Appendix C). This questionnaire was developed by Clary et al. (1998) and was a measure frequently used in similar research studies (Markus et al., 1993; Stukas & Synder, 1999). This questionnaire measured different social functions by involvement in volunteerism. The six functions measured consisted of values, understanding, enhancement, career, social, and protective. The Cronbach’s alphas for these functions range from .80-.89. A sample question from this questionnaire that measured the career function, or the motivation to volunteer to gain career-related experience, is “Volunteering can help me get my foot in the door at a place where I’d like to work” (Clary et al., 1998). Responses for each question were scored on a 7-point scale ranging from not at all important/ accurate for me to extremely important/accurate for me. Modified Rosenberg Self-Esteem Scale. Self-esteem, a dependent variable in this study, was measured using the Modified Rosenberg Self-Esteem Scale (see Appendix D). This scale, developed by Zimprich, Peeren, and Hornung (2005), used a modified Likert scale in order to evaluate self-esteem. This scale consists of 10 questions and has a high internal consistency with a Cronbach’s alpha of .79. A sample question from this questionnaire is “On a whole, I am satisfied with myself” (Zimprich et al., 2005). A high score on this scale indicates a high level of self-esteem. Hope Scale. As mentioned, hope is a dependent variable of this study that is being defined as “a cognitive set that is composed of a reciprocally derived sense of successful agency, or goal-directed determination, and pathways, planning of ways to meet goals” (Synder et al., 1991, p.570). This scale, developed by Synder et al. (1991) consists of 12 questions and ranges from 1, definitely false to 4, definitely true (see Appendix E). The Cronbach’s alpha for this scale ranges from .74-.84. A sample question on this survey that measures agency is “I energetically pursue my goals” (Synder et al., 1991). The participants for this study consisted of Connecticut College students in introductory psychology courses. The data for this research was collected via an online survey. Students signed up for this study by writing their names on sign up sheets located in Bill Hall. Then, participants received an email with a link to the surveys. The order of the surveys were Volunteer Functions Inventory, the Modified Rosenberg Self-Esteem Scale, and then the Hope Scale. There were no ethical issues in this experiment. conducted. The modified Rosenberg Self-Esteem Scale was found to be highly reliable (10 items, α =.901). The Cronbach’s alpha for the hope scale was .789. Then, the reliability for the six subscales of the Volunteers Functions Inventory were analyzed. Cronbach’s alphas for the enhancement function and the protective function were .866 and .845, respectively. In addition, the Cronbach’s alphas for the career function (α =.802) and social functions (α = .721) were acceptable. Finally, Cronbach’s alphas for the understanding function and the values function were .823 and .871, respectively. 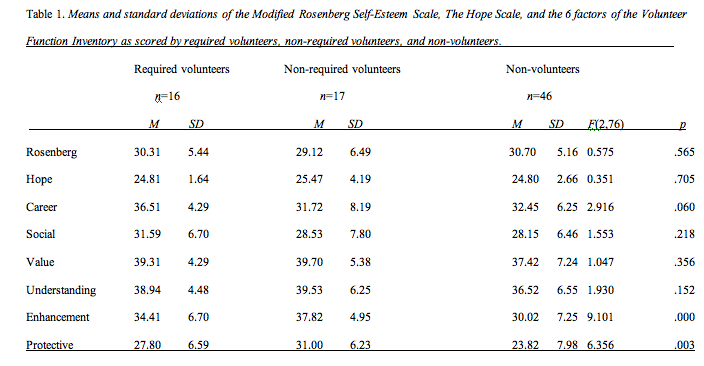 To evaluate the hypothesis that non-required volunteers would report having higher self-esteem, agency, and different motivations and outcomes measured by functions of volunteering than do required volunteers and nonvolunteers, a multivariate analysis was performed. The analysis indicated a significant multivariate effect between current volunteer status and self-esteem, agency, and outcomes, Wilks’s lambda=.68, F(16, 138)=1.824, p=.034. Univariate analysis of variance revealed a significant difference for the enhancement function, F (2, 76)=9.101, p<.001. In addition, there was a significant difference between current volunteer status and the protective function, F (2, 76)=6.356, p=.003. Univariate analysis revealed no significant differences for the social function, p=.218, nor the value function, p=.356. In addition, there were no significant differences for the understanding function, p =.152, nor the career function, p=.060. There were no significant differences for self-esteem, F (2, 76)=0.575, p=.565. Similarly, there were no significant differences for hope, F (2,76)=0.351, p=.705. For the enhancement function, Tukey post hoc tests indicated a significant difference between non-volunteers and non-required volunteers, p<.001, with non-volunteers reporting lower enhancement scores. Similarly, Tukey post hoc tests for the protective function indicated a significant difference between non-volunteers and non-required volunteers, p=.003, with nonvolunteers reporting lower protective scores. Table 1 presents the means and standard deviations. The present study examined the differences of internal benefits from volunteering between required volunteers, non-required volunteers, and nonvolunteers. It was hypothesized that non-required volunteers would report more internal benefits from volunteering, such as self-esteem and hope, than required volunteers and non-volunteers. In addition, it was hypothesized that nonrequired volunteers would have different motivations and outcomes of volunteering than required volunteers and non-volunteers. While the first hypothesis was not supported, the second hypothesis was supported. The present study used the Volunteer Function Inventory (Clary et al., 1998) to assess motivations and outcomes of volunteering. Using this measure, the present study found that non-required volunteers are more likely to volunteer in order gain the enhancement and protective aspects of volunteering than nonvolunteers. The differences in the protective function suggests that non-required volunteers are significantly more motivated to volunteer “to reduce negative feelings, such as guilt, or to address personal problems” than non-volunteers (Clary et al., 1998, p. 1520). Similarly, significant differences for the enhancement function suggest that non-required volunteers are more likely to volunteer because they want “to grow and develop psychologically through involvement in volunteering”(Clary et al., 1998, p. 1520). These results support previous studies, suggesting that motivations and outcomes of volunteering differ between non-required volunteers and non-volunteers (Beehr et al., 2010; Markus et al., 1993; Stukas & Synder, 1999). In general, these findings not only supported the second hypothesis but may provide insist as to why some people chose to volunteer and others do not. In addition, this study found that there were no significant differences between non-required volunteers, required volunteers, and non-volunteers in terms of self-esteem or hope. This finding contradicts previous studies that suggested volunteerism is associated with higher levels of self-esteem (Mellor et al.,2008; Pillavin & Siefl, 2007; Thoits & Hewitt, 2001). This suggests that individuals who volunteer, regardless of requirements or lack there of, do not have higher self-esteem than do their non-volunteering peers. Similarly, these findings suggest that individuals who volunteer do not report having higher levels of agency or pathways, which were measured as subscales of the Hope Scale (Synder et al.,1991), than do non-volunteers. The present study had some limitations. First, the participants in this study did not provide much diversity. Approximately 85% of participants were freshmen or sophomores in introductory psychology courses at Connecticut College. This may account for the fact that 46 of the 79 participants were nonvolunteers. In other words, because the vast majority of the participants were first and second year students, participants may have not had as many opportunities to volunteer in college thus far. Another limitation of this study was that the amount of participants in each cell was fairly uneven. The fact that only 16 participants were required volunteers and only 17 were non-required volunteers, in comparison to 46 non-volunteers, may have skewed the data. Specifically, if the groups were more evenly distributed there may have been more statistical power. If this were the case, perhaps differences between required and non-required volunteers would have been more pronounced. The results of the present study have a practical implication for colleges wondering if they should integrate required volunteerism into their curricula. The current study contradicted previous studies that argued that requiring individuals to volunteer reduces the internal benefits of volunteering (Beehr et al., 2010; Stukas & Synder, 1999). Specifically, the present study showed that required volunteers and non-required volunteers had similar levels of selfesteem, agency, and pathways. This suggests that colleges should continue to implement required volunteerism into college classrooms because taking away one’s choice to volunteer does not appear to reduce benefits of volunteerism. In terms of future research, there are a wide range of directions that research on volunteerism can explore. First, research can look to explore gender differences of motivations to volunteer with the use of the Volunteer Functions Inventory (Clary et al., 1998). This could expand on the present study by examining if men and women are equally motivated to volunteer in order to achieve the enhancement and protective functions or differ in terms of motivations. This direction of research may provide insight to organizations on how they can attract more individuals to volunteer. Another suggestion for future research includes investigating the role that work study plays on volunteering outcomes. Specifically, one could examine whether receiving work study compensation is related to differing outcomes of volunteerism, such as self-esteem and hope. In addition, future research should explore differences in motivation and outcomes between non-required volunteers and required work study volunteers. Clearly, there are many options that future research can explore when studying the outcomes of volunteerism and a wide variety of approaches to do so. Astin, A.W., Sax, L.J., & Avalos, J. (1999). Long-term effects of volunteerism during the undergraduate years. Review of Higher Education, 22(2), 187-202. Barber, B. R., & Battistoni, R. (1993). A season of service: Introducing service learning into the liberal arts curriculum. PS: Political Science & Politics, 26, 235-240. Hatcher, J. A., & Bringle, R. G. (1997). Reflection: Bridging the gap between service and learning. College Teaching, 45, 153-158. Levine, A., & Hirsch, D. (1991). Undergraduates in transition: A new wave of activism on American college campus. Higher Education, 22, 119-128. Markus, G. B., Howard, J. P. F., & King, D. C. (1993). Integrating community service and classroom instruction enhances learning: Results from an experiment. Educational Evaluation and Policy Analysis, 15, 410-419. Pearce, J. L. (1983). Job attitude and motivation differences between volunteers and employees from comparable organizations. Journal of Applied Psychology, 68, 646-652. Strage, A. (2004). Long-term academic benefits of service-learning: When and where do they manifest themselves? College Student Journal, 38, 257-261.